I started a new job last week, so I haven’t been able to get much hobbying or boardgaming in lately. I didn’t want to let this blog drop off the face of the internet again, so I’ll take a moment to brag about what I managed to score last weekend–I was one of only 1000 people (number 691 specifically) to get one of the limited edition Void Shield Generators from GW!!! This model is amazing! There is an insane amount of detail on this cool looking piece of terrain; it’s going to be a lot of fun to paint up when I finally get around to it. The model is a pale green in the photo I posted. This is because isn’t because I primed it this odd color, it’s because this model is made from a hard polystone resin. 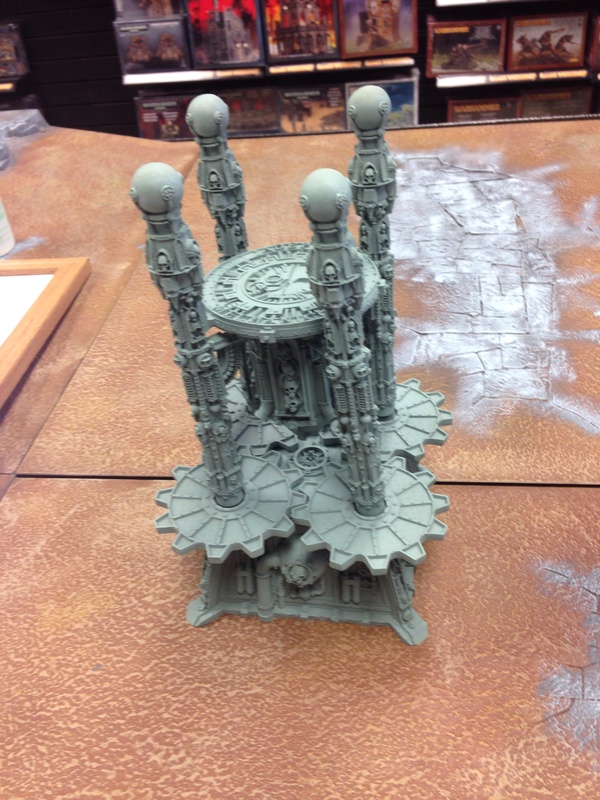 If I’m not mistaken, this is the same material GW has previously used to make limited edition terrain pieces, but the ones of those I have seen came prepainted, so I couldn’t see what color the resin they used in those cases was. Many have speculated as to the reasoning for GW making this model limited to only 1000 worldwide. In-game this model is pretty awesome–100 points gets you 3 void shields within 12″ of the model and you can bring a network of up to 3. In a post Chapterhouse v. Games Workshop world, if GW has rules for something published you can be assured they will be coming out with a model for it soon. That being said, having talked to a GW model designer at Games Day, I was told that it can take up to a year for a model to go from concept to full production. The limited release of the Void Shield Generator may have been to preempt any third-party models for the same and thus protect their copyright. A mass market production of this model might be available down the road, but the molds for large-scale production may not be ready yet. Whatever GW’s reasoning is, I definitely feel very lucky to have gotten one.